A while ago, I asked the question: what is the link between the ancestors and the earth? There is the obvious: most of us bury our dead in the earth. Even in coffins, their essence can leak out into the earth. In fact, the history of death, burials, cemeteries around the world is a lesson in the creation of sanitation laws, health guidelines, and corporate development for the living and the dead. Recently I heard something very interesting: so many unfulfilled dreams are in cemeteries, buried with the dead. So, there is also the not so obvious: the energy that emanates from the ancestors - their dreams, desires, and wants, unfulfilled or satisfied - is the energy we walk on and in every day. It comes up through our feet, which represent our paths in life. We are, therefore, never separate from our dead or they from us. If you have ever visited Arlington Cemetery, you know what I am talking about. One must walk over the dead to get to the dead. It is humbling, frightening, overwhelming, sacred, and profane all at the same time. When I have visited there, I want to run so as not to linger so long in one place. Yet, I want to walk slowly to not disturb, to honor, to read the headstones. I want to listen to what is being whispered through the dirt and grass, the trees. Brings a different understanding of why it behooves us to care for our living elderly, care for the ancestors, and care for the dead and their spaces. Gives a different understanding to why we must live fully and not die after a half-lived or un-lived life, and why we must not leave our dead behind. This last is another discussion that would bring us to the current violences all over the world. I think of these things often, and especially during the spring and summer. During the first season we plant. The second season we reap. And, our reaping from our personal home garden has been glorious this year so far: collard greens, kale, chard, lettuce, herbs, tomatoes, onions, garlic. Corn and cucumbers to arrive soon. And the yellow zucchini. It was the yellow zucchini that made me write this post. A few days ago, we removed the first and only one so far from its vine. One day we steamed half, a few days later, we roasted the other half along with some chicken wings. (Sorry: Only after we had eaten did I think I should have taken a picture). All I can tell you is that when I bit into a chunk, down to the skin, my first thought was that I was so grateful for the man whose gift of honoring the ancestors through the land had produced this singular and beautiful feast. I thanked the ancestors. And, then I wondered at its sweetness, so unexpected. It was startlingly vibrant just like its flower. Until last year, I had never seen a zucchini flower, did not know it had one on a vine. But, the flower in half or full bloom is so worth observing. What ancestral energy is flowing through the land where we are? The history here makes me shudder when I think about it. Yet, the ability to connect to that energy, shift its vibrational force, and harvest abundance and gratitude instead of scarcity and fear each time is a gift that cannot be seen outside the cycle of life that includes the ancestors. There is so much more to think about as the summer continues. What will I discover with each new collard leaf, or rosemary stem? What will I discover with each yellow tomato or the cucumbers? I am waiting for the cucumbers. Two are hanging, almost ready to be welcomed to the table. During this New Moon meditation, Spirit asked me: What is surrender and what does it mean to surrender? Surrender is often interpreted in terms of loss and victory. While this may be true in many situations, I am choosing to view it differently for this purpose. As you may remember, the question that Spirit asked me during the February 2013 Full Moon meditation was "What does it mean to be free"? The questions seem to go hand-in-hand, though I'm not sure in what order and if that order is the same each time. I have been thinking a lot about surrender during this cleanse. Most of you know that I am ordered and diligent about my schedule and getting things done on time, if ahead of time. However, you may have noticed that I have kept rather quiet, not even posting comments or blog entries. Why: I have been allowing myself to surrender to doing "nothing". And it has been good. At some point, I realized that the schedule I had made was not going to be kept. I didn't want to keep it. I also realized that I could not. What I needed: more space to breathe and to allow my thoughts to settle after an intensive teaching year. More space in my office. More of everything that is not confining. More laughter with my Beloved and my sister-friends. So, I did what one of my favorite cards advises: I settled for more… of everything. Mercury Retrograde is often a good and productive time for me to communicate, travel, and get things done. This has been a busy period for me with new projects and speaking in depth to many of you. As we near the end of the cleanse, however, I feel myself becoming quiet. Still. As I was cooking today, I basked in the sun coming through the window and the absolute glorious silence of no cars passing on the street for an extended period of time. I couldn't even find a thought until I made one. It was so wonderful to take a few hours to cook a simple dish. Something that could have been done in one hour took me two hours because I wanted to chop the onions finely and watch them sauté. I wanted to shred the chicken instead of cut it. I wanted to make a curry paste from scratch, slice mangoes and yellow tomatoes from the garden. Make lemonade. Yum. Too often we "stick to it" or rush through it. Either way we don't give ourselves enough time to contemplate what our mind, body, heart, and spirit are telling us: if we just allow a few more minutes, days, weeks, months - years even - to rest or think on something, our struggle to complete whatever it is can be reduced to almost nothing. The extra time we take could prevent us from making a mistake or help us make a better decision. Timing is everything and the information we need may not be quite ready for us to access it - or maybe we are not ready. So, surrendering for me (this moment in time, today) is about knowing when to say yes to stillness and not moving forward in human time. There is a freedom that comes with that indeed: Releasing false expectations and fear that lead to frustration, ego, anxiety, anger, and reaction. This means that when it is time for me to take action I can do so clearly without second-guessing or floundering. The New Moon brought me many new adventures, including babies as I take up a new role in my healing life as a birth and postpartum doula. The babies are teaching me every day. They arrive when they are ready, not when they are "due". Because it is we on the outside who set the due date based on a series of observations that are nebulous. Yet, we have to prepare and plan for them as if we really know what they are going to do. In this way we are ready when they are ready. It is a wonderful task of listening to what can be seen and not seen, heard and not heard. Doing birth work requires me to constantly be a woman with an oxymoronic perspective: fluid schedule and birth plan are terms that come to mind. I imagine the ancestors waiting to be born having some really good laughs as they choose when, to whom, and where they will be born. Every now and then they throw in a twist and arrive on the “due” date. Of course, we get happy and think how perfectly we worked it out. But really, it’s just the ancestors playing with us, giving us a break every now and then. At this moment, then, I have come back to something I began to understand when I first became a priest: surrender can be a collaboration between myself and whatever I am resisting. In letting go of my resistance, I learn and see so much I had not seen or known before. This has certainly been the case in me letting go of my schedule and allowing my mind to just observe all that I think was necessary and important. My Caribbean curried chicken salad with mangoes and raisins on a lovely bed of lettuce from the garden is testament to what can happen in extended moments of doing nothing supported by breathing unfettered by gasps or unconscious holding. In the end, clarity, flavors and colors, and desire all surface and are exquisitely revealed and satisfied. This week marks the 14th anniversary of my initiation into the Egungun society. Honor and gratitude to Olodumare, my ancestors, and the orisas. Honor and gratitude to my Godmother and Godfather who brought me into this part of my life. Honor and gratitude to my "twin flame" for always burning brightly with me and for walking this path as well. It also marks the 9th anniversary of the creation of my Sister-Healer community with three women who remind me every day why I am grateful I was born (again) this life in this place and time. Earlier this week, they and my youngest godchild came to visit me from Chicago. It is a five-hour drive to see me, and they came for one night only. A long way, someone might say, just to stay a night, have some food, laugh, sing, heal, and pray. But, that was precisely the point: How far would you go to see family? Their visit was specifically to mark the creation of us. This was the 9th year since our meeting, the number of change and transformation, the proper time for us to acknowledge all that had happened in these nine years and all that was to come in the next nine. 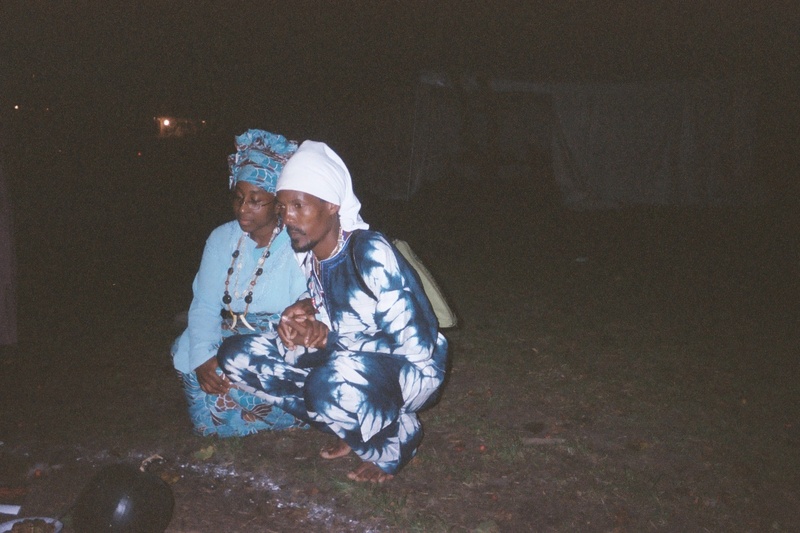 We recommitted our lives and paths to serving the Creator, the Ancestors, the Orisas, and each other. Most importantly, we gave thanks to them all for bringing us through Life and preparing us for more of Life. Me: I give thanks often for having the good sense to listen when my Ancestors speak. I remember the day we came together. Trying to be the dutiful new priest, I was cleaning and preparing my ancestral shrine to commemorate my anniversary. The phone rang and I answered it because I had not yet started ritual. "Girl, we're down here at the beach. Why don't you come and join us?" I politely declined and explained why. Trying to be the dutiful priests that they were, they understood and politely said "another time". As soon as I hung up the phone, I heard a heavy voice say: "You fool. You better get on down to that beach. This can wait. Take care of what needs to be done". So... trying to be the dutiful new priest, I called the women back and told them what bus I'd be on. The rest is herstory. We left the beach, piled into a tiny Honda, and headed towards the nearest grocery store. We bought whatever we could get with whatever we had in our pockets at the moment and returned to my place to prepare a feast. We ate on the floor looking out the windows at Lake Michigan. What needed to be done that day? I needed to remember the living to keep balance. At the time, I didn't know that these women were ancestral workers themselves. We knew each other as poets. And, I needed to understand that serving the ancestors didn't always mean sitting in front of my shrine, doing ritual, sequestering myself. In fact, since 1999 I have learned that being the dutiful ancestral priest often means tending to and teaching the living. The day I received that phone call, it certainly meant accepting an invitation to community that would teach me just as much as tending to my shrine would do. I have kept this lesson dear to my heart not only because that day I gained such love and support, but also because it has taught me to think outside of ritual for ways I can honor my ancestors. The truth is, almost everything we do is ritual, and even the most mundane activity can be made sacred. For example, I love (an understatement if you know the truth) to dance. But sometimes when I dance, I remember my godmother. I remember that her 70th birthday party started one mid-afternoon in Brooklyn and ended the next day. She loved to dance and we all danced - right out the door at 2 a.m. What better way to honor this woman who taught me what it was to be an elegant, graceful Black woman than to "shake a tail feather" when I desire, how I desire? Months ago, I had been given the message that I needed to do something big for my ancestors. So, I began planning days to clean, putting out my shrine, food to cook, time to pray. Then, the women said they were coming to visit. And I knew that "something big" meant once again opening up my living room to these beautiful, powerful, dutiful priests who were unafraid to shake more than a tail feather. What else could I do but say yes, and remember that being a fool has its limitations. Besides, every now and then we have to disrupt our own staid stories. Last week my mother would have been 83 years old had she lived past her 49th birthday. Some years, I ask "what if?" Other years I remember. This year it was a little of both. Since I began this journey of healing, I have often thought: if only I knew then what I know now - I could have helped her suffer less, lived longer. But, now is now. Then - which we try so hard to get back and not let go - cannot be changed, only our relationship to it. My mother and grandmother taught me this nearly 20 years ago when they became one of the events that initiated my belief in the phenomena happening to me. On this day, I was relaxing. Just listening to the cars pass by, enjoying the solitude of having the house to myself. For no reason I can explain, I bent my head back on the pillow to look across the hall. What did I see? My mother and grandmother walking into the bedroom, my mother in her nurse's uniform, and my grandmother in one of her shin-length cotton frocks and her big straw hat. They looked at me with so much love and my mother told me all was forgiven. I had been a child doing what children do. They took my hands, pulled my arms up and over my head, and traced a symbol into the inside of my palms over and over again. Then they made me stand up and traced the symbol over my body. They walked out of the room, never taking their eyes off me. I remember feeling relieved: my mother knew that I loved her. I cried for a long time. Afterward, I drew the symbol so I would not forget it. Fast forward several years later. I am completing my Reiki Master I training. During the initiation, the Master doing the work finishes the process and I wait to be directed towards my seat. Instead, I feel him grab my arms again, lift them up, and start again. Afterward, he explains that he was told to give me another symbol, one he has never seen or heard of before. However, he was clear that Spirit had told him to do this. He offered to draw the symbol for me so I could have it. When he finishes the drawing, I smile and tell him that I know the symbol and that years ago my mother and grandmother had given it to me in a waking vision. Although, even at this writing, I do not know what the symbol means, it was clear then as it is now that my Ancestors had initiated a process in one realm that was - is always - confirmed in this realm. What was also clear: I did not need to be afraid. What was unseen would eventually reveal itself if I allowed it to do so. ... the Ancestors said: Keep it real and immediate. I will return later to the series of unexplainable events that made me stop asking and start believing, knowing, accepting, and doing. But for today, just for today, I'll tell you about yesterday. It is my practice during meditation to ask the Ancestors to "show me the way". And they have: resources and responses arrive the day after I have asked for guidance. This has revealed to me the power of our connection and the urgency of what needs to be done and how. Halfway through my meditation last night, I heard something fall in my office. I noted it and continued sitting until it was time to end. When I checked my office, I discovered that three books had fallen off a bottom shelf. Although I had been cleaning earlier in the day, these had not been situated in a way that would cause them to topple. • Jambalaya: The Natural Woman's Book. (Luisah Teish, 1985). The first African-centered healing book about the Orisas and Ancestors I ever bought, and one of the earliest published on the subject. Iya Teish was the first African-based practitioner I had ever met, and the first person to ask me to write the story of how I got my head. That is, to write the story of how I chose my destiny. She was also someone who spoke openly about the need for women to have community to save their lives and the lives of their children. • Saints, Sinners, Saviors: Strong Black Women in African American Literature (Trudier Harris, 2001). A book I only discovered two years ago. I used it as the model for a course in which I researched women as cultural healers and community workers. • Mother's Underground - Issue: The Womb (1992). The title says it all. This was one of the first magazines that published my writing. If one had fallen, it may have meant something. However, I might have easily just returned the book to the shelf. However, three falling at the same time, all connected to beginnings and births? What do I do when something like this happens? I accept that it is another response to my petition. Because I am working on answering the question "Where will you go next? ", I know that these three texts are the answer. Because I have a history with them and the people associated with them, I can choose to delve into them in a myriad of ways to get a fuller meaning. For example: Are the writers models or mentors? So, instead of putting them on the shelf, I have put them on my desk. They have no hidden codes except what I interpret from cover to cover, and within the contexts of the questions I am asking, the paths I am pursuing, and the project on which I am working. If they had been tarot cards or divination shells, the reading would go something like this: Return to the origins of your initiation into this work. You are about to give birth to your ideas. Community will be present. You must work hard to create and maintain all that you have. Remember: walk the path of your African Ancestors. The High Priestess, Mother, Healer are with you. Remember why you chose to be born here. The Ancestors could not have spoken louder. If their voices were audible as ours are in the world, they would be saying: Daughter, your questions have all been answered. And my Ancestors would add: Do not ask again. "Tell them Arroyo sent you." This is part of the message the Ancestors gave me when I arrived at the tip of Brazil, February 11, 1999. A 17-day sailing trip from Barbados during which I was silent most of the way. Retracing Middle Passage Routes for six weeks will do that to you. The words came in Portuguese, a language I did not speak at the time. In fact, when I returned to the United States, I called the Brazilian consulate to ask someone to translate what I had written in my journal. In its entirety, the message was a mandate for me to remember the chains that bind us and to help others heal what had wounded them. "Us" being sentient beings. To accomplish this, I would have to excavate what was hidden under the skin, in dreams, in a smile, or a slight turn of a head. And, in turn, those working with me would have to look at what had been found and decide what to keep, let go, throw away, or reconstitute. Together we would have to decide how to create what was important this moment in time and space to do so. Since 1999 I have been doing what the Ancestors told me to do, but there is more. Always more to do. This blog is to share some of the messages I have received since that day. However, it is also to discuss "the work" that needs to be done - and that gets done - in our communities, neighborhoods, families, classrooms, and our selves to heal the things that remain buried so deeply they do not wake us at night but seep into our lives surreptitiously until they become real, tangible, overwhelming. Like violence and illness, discontentment and anger. And fear. Three times a year I contemplate these messages and the work from a different perspective when Mercury is retrograde. A perfect time to retreat, seek a haven from doing and relish in being. During this first retrograde of the year, however, I find myself actively doing and being, and finally coming to a consensus with my many selves about how to communicate this mandate, and the type of community that is needed to carry it out in all its many manifestations. It is hard to believe that almost 15 years have gone by since I took up my pencil and began writing while we approached Fortaleza. It was the first time I had ever seen the huge white windmills that can be found almost every where now. It was the day we were close enough to the equator for me to calculate what time we would cross it. I remember thinking: how long would the lead last on the paper (all the pens had stopped working) and what would I do with this information I couldn't even read. So, what exactly does it mean to do what the Ancestors tell me to do? And, who are they any way? In the simplest terms: The Ancestors are people no longer living. Most directly they are the people to whom we are biologically connected. However, they are also people with whom we have other connections. For example, non-blood "family" or extended family. If we are artists, we may consider the artists who cleared the path before us our ancestors as well. For me, my Ancestors are a combination of all of the above. My biological ancestors speak the loudest and it is to them that I have specific obligations. It is they who give me mandates. Sometimes, I have to determine whose voice and mandate must be addressed first because occasionally everyone has something for me to do. Imagine that you are the youngest child at a family gathering and all the aunts and uncles are calling your name simultaneously. However, I have also been blessed with the gift of being able to hear a larger group of ancestors, those who at the moment remain in a liminal space, who have been unable to reconnect to their living families, or who are unable to make the final transition. My husband and I at an outdoor ancestral shrine (Chicago 2007). Doing what the Ancestors tell me to do? How do they sound? What do they say? Do I always do what they say? I have been learning the answers to the first two questions (and others) for years now. And, just when I think I "got it", something changes. I had to develop an "Ancestral Lexicon" for myself comprised of dreams, messages from other people, guidance from elders, "signs", sounds, prayers, and good old common sense. My biggest connections, however, are at my shrine and through dreams. In the former, I am able to connect with them via prayer and ritual. In the latter, they are able to connect with me when I, too, am in a liminal space. It helps when someone with whom I am familiar appears in person. Less to to guess. Often, my ancestors will make themselves known to me as a confirmation about something I have been thinking or feeling. Do I always do what they say? Yes. I learned early on that to do otherwise caused results I didn't want, and often chaos and pain that had the potential to carry over into another lifetime. How do I know this is not my own "mind" speaking to me or my imagination? I used to ask myself this question, even developed a series of tests to prove that it was all me. However, a series of unexplainable events - phenomena - happened that made me stop asking and start believing, knowing, accepting, and doing. During my Full Moon meditation (February 23), Spirit asked me: “What does it mean to be free”? “What do you mean by freedom?” For me, to be Free is to be without Fear. Reaction instead of Action is what happens when we respond to fear. Reacting often comes from a place of frustration, ego, anxiety/anger – an immediate response when we have not developed the ability to stop mid-word, sentence, movement and breathe, think, ask for guidance in the moment. Thich Nhat Hanh suggests that if we find ourselves about to argue with someone that we should breathe, stop, and simply say: I am unable to discuss this calmly at the moment, may we take a moment (or two, or an hour) and return to this issue when we are both able to discuss it. This gives us the time to allow our breath to settle us and for us to enter a silence that may reveal ourselves (or the other person) in an unexpected way. Being able to act out of love and compassion towards ourselves, the other person, and the situation in which you find yourselves can lead to healing you could not have planned. Each of us will understand "freedom" and being "free" in different ways depending on our backgrounds and where we are this moment in time. I came to understand these words in a profound way in 1994 when watching a news story on Rwanda by Jim Wooten. It was about young girl whose mother had to bury her on the "airport road" - a mass grave - as she was fleeing for her life. Afterwards, I could not stop hearing the little girl's voice. It took me many months to stop running away (literally) from her voice and her story. However, what began as a terrifying experience for me - not nearly what it had been for her or her mother, ended in a poem in her voice so she, a young ancestor, would not be forgotten. Nor would her message: death and dying bring their own freedom and understanding of what it means to be free. She wanted to share this message with her mother and release her from the deep feeling of failure of responsibility that she must have felt. Mama, this is what they mean by freedom." Because releasing our expectations and fears often feel like dying, this message remains for me a lesson in letting go, becoming unattached to the outcome, and knowing to whom and to what I am responsible in the process of doing so. © 2013 Maria Hamilton. Watermark theme. Powered by Blogger.